We wanted to create the most immediate, easily-accessible way to enjoy online radio available, so we've stripped everything back to the essentials. Nothing gets in the way of the music - fire it up, choose a genre and dive in. 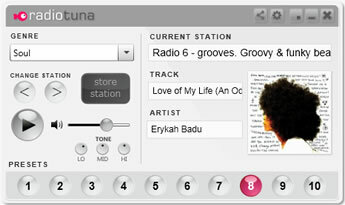 The player utilizes Radio Tuna's own algorithms to fingerprint and sort radio stations by the genres of music that they play. This means we can separate them into fine-grained genres such as Dub Techno, Lovers Rock and Chiptune in a way that no other station index can. The app also displays relevant cover art which is linked to Amazon, so you can buy the music that you like. With an intuitive interface and effortless navigation, exploring the long tail of radio has never been more enjoyable.